To keep things cool in the kitchen, I tend to make more salads during the summer months. This Steak Ceasar Salad is a favorite of ours because the dressing is absolutely delicious. Making a homemade salad dressing beats any bottled version and it's easier than you think! Ceasar salad dressing may be a bit intimidating to make from scratch because traditionally, it involves anchovies and raw egg yolks. However, as intimidating as it may be, I find it well worth the effort to make it because the true flavor is hard to imitate otherwise. To make this more of a meal, I added leftover ribeye steak that we grilled the night before. You could also use cooked chicken breast instead. This is one salad that's wonderful in the summer or year round as part of a big meal. To assemble the salad: Tear the lettuce into a large bowl. 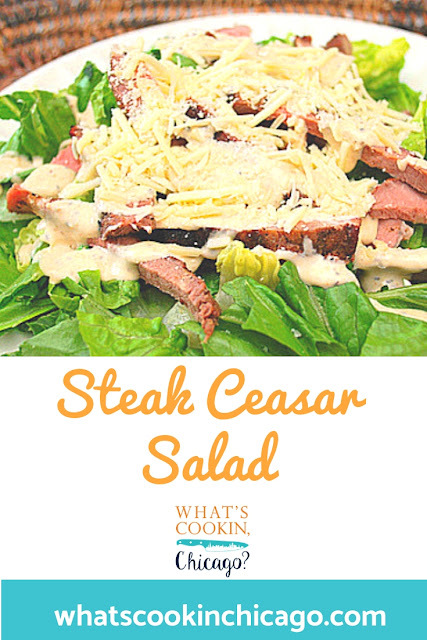 Add enough dressing to coat the salad to your liking. 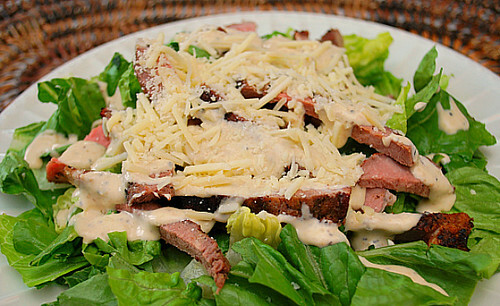 Add the sliced steak and some extra Parmesan and toss the salad well. Serve immediately.